Au Revoir Simone( Erika Forster, Annie Hart, and Heather D’Angelo) demonstrate just how layered synth music (triple keyboard action!) should work, how it can sound warm, human and emotive. True there is a glacial beauty about their sound but at no point does it ever sound cold, or detached. In the past bands who have employed drum machines and synths as their primary source of instrumentation have been accused of sounding clinical or robotic. 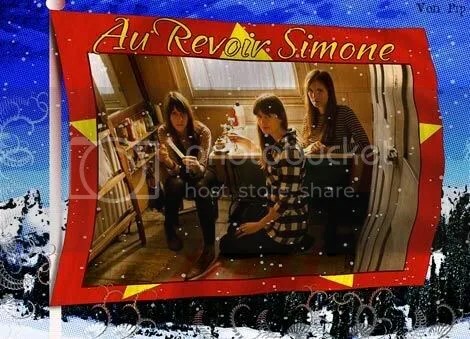 Au Revoir Simone could never have this criticism leveled at them. Beneath the electronic frosting they have a passionately beating heart, and their songs celebrate the spirituality of nature, reflect a sense of wonder at the joy of being, and are expertly combined with sweeping synths and wistful, dreamy vocals. These songs conjure up setting suns, mountain lakes and shimmering star fretted skies. This is music that truly transports the listener to a different place, whether its the halcyon days of those endless sun filled school holidays of yore or the warming glow of Christmas lights through a frosted window on Christmas Eve. There is without doubt a TS Eliot type quality to the “feel of the music. ”In a sense “the music sounds visual” (listen to the music, close your eyes, and you`ll get what i mean) You can certainly understand why somebody like David Lynch is apparently such a fan. But its not all hypnotic, ethereal beauty and celestial voices, they can lay down some seriously danceable pop tunes too. Their latest album “The Bird Of Music “ showcases this diversity and proves that they really are the aural equivalent of the “Aurora Borealis”. appealed to you all about it?